Buddy Gene Emmons (January 27, 1937 – July 21, 2015) was an American musician who is widely regarded as the world's foremost pedal steel guitarist of his day. He was inducted into the Steel Guitar Hall of Fame in 1981. Affectionately known by the nickname "Big E", Emmons' primary genre was American country music, but he also performed jazz and Western swing. He recorded with Linda Ronstadt, Gram Parsons, The Everly Brothers, The Carpenters, Roger Miller, Ernest Tubb, John Hartford, Little Jimmy Dickens, Ray Price, Judy Collins, George Strait, John Sebastian, and Ray Charles and was a widely sought session musician in Nashville and Los Angeles. Emmons made significant innovations to the steel guitar, adding two additional strings and an additional pedal, changes which have been adopted as standard in the modern-day instrument. His name is on a US patent for a mechanism to raise and lower the pitch of a string on a steel guitar and return to the original pitch without going out of tune. He won the Academy of Country Music's "Best Steel Guitarist" nine times, beginning in 1969. In 2013, two years before his death, he was honored by the Country Music Hall of Fame in a tribute called "The Big E: Salute to Buddy Emmons" featuring testimonials and performances by eminent musicians and hall of fame members. Emmons was born in Mishawaka, Indiana. When he was eleven years old, his father bought him a lap steel guitar and arranged for lessons at the Hawaiian Conservatory of Music in South Bend, Indiana, which he attended for about a year. He then began figuring out how to play the country music that he heard on the radio. He has said that Jerry Byrd and Herb Remington were among his first musical influences. By age fifteen, his playing had progressed considerably. His parents bought him a triple-neck Fender Stringmaster steel guitar, and he began performing with local bands in South Bend. The next year, Little Jimmy Dickens heard Emmons playing with Casey Clark and offered him a job with his band, so at the age of 18, in July, 1955, Emmons moved to Nashville. Dickens's band was then a popular act in country music, with complex arrangements and fast twin guitar harmonies. Dickens arranged for his band to record several instrumentals on Columbia Records under the name The Country Boys. The first tunes recorded included three of Emmons's originals, two of which, "Raising the Dickens" and "Buddie's Boogie", became steel-guitar standards. In 1956, Dickens dissolved his band to perform as a solo act. Emmons began doing recording sessions in Nashville. One of his first studio sessions resulted in Faron Young's hit version of "Sweet Dreams". In late 1956, Emmons contributed to the evolution of the pedal steel guitar by splitting the function of the two pedals that changed the pitch of several strings from a tonic chord to a sub-dominant chord. This "split-pedal" setup is now the standard pedal arrangement in the E9 tuning, since it allows greater musical flexibility than the earlier pedal setup pioneered by Bud Isaacs. Emmons recalls that he first used this split-pedal innovation on Ernest Tubb's "Half a Mind (to Leave You)". Emmons' name is on a US patent for a mechanism to raise and lower the pitch of a string on a steel guitar and return to the original pitch without going out of tune. Prior to his invention, the problem of a string going out of tune after stretching to raise pitch, and loosening to lower the pitch had been a vexing problem in the design of the instrument. Emmons and Shot Jackson formed the Sho-Bud ("SHOt-BUDdy") Company to design and build pedal steel guitars in 1956. In 1962, Emmons added two additional strings to the upper register of the E9 neck of the pedal steel guitar. In 1957, Emmons (by then nicknamed the "Big E" for both his 6-foot height and musical prowess) joined Ernest Tubb's Texas Troubadours. His first recording with Tubb, "Half a Mind (to Leave You)", became a hit record. In 1958, Emmons quit Tubb's band and moved to California. Eight months later, he returned to Nashville and rejoined the Texas Troubadours as the lead guitar player for the next five months, at which point he returned to the pedal steel guitar chair in the band. In 1962, he left Tubb to join Ray Price and the Cherokee Cowboys, replacing his long-time friend, steel-guitarist Jimmy Day. His first recording with Price in September, 1962, produced the hit song, "You Took Her Off My Hands". On this song Emmons used another of his major steel guitar innovations, adding two "chromatic" strings (F# and D#) to the E9th tuning. These "chromatic strings" have since become part of the standard 10-string pedal steel guitar tuning. Price soon appointed Emmons to be his bandleader, and Emmons created many of the arrangements on Price's recordings over the next several years. After trying without success to get Shot Jackson interested in his new guitar design ideas, Emmons left Sho-Bud in 1963 and formed the Emmons Guitar Company. Meanwhile, Emmons' long-time friend, songwriter Roger Miller, offered him a job in his band in California. Emmons moved to Los Angeles, playing bass in Roger Miller's band and doing studio work on pedal steel. Also in 1977, he played steel guitar and resonator/dobro on Christian singer Don Francisco's album "Forgiven". This album was recorded in Nashville. In 1990, Emmons and Ray Pennington formed the Swing Shift Band and began producing a series of CDs that included big band swing, Western swing, and original country songs. Emmons began touring with The Everly Brothers in 1991, which continued until about 2001. He discontinued regular session work around 1998 to tour with The Everlys. Emmons' son, Larry, from his first marriage, later became a professional musician, playing bass with Ernest Tubb. According to a 1965 interview, Emmons and his second wife, Gigi "have two children, Buddie Gene and Tami." In 1967, he married his third wife, Peggy, who brought twin girls, Debbie and Diana, from her first marriage. About 2001, Emmons began suffering from a repetitive motion injury to his right thumb and wrist, which caused him to stop playing for over a year. He did not to return to regular recording session work, but did record with some artists he had known for many years, such as Ray Price, Johnny Bush, and Willie Nelson. He continued to perform at steel guitar shows and on American Public Media's A Prairie Home Companion until his death. He struggled with alcohol and amphetamine dependency and credited his wife Peggy for aiding his recovery. Emmons has three granddaughters, Crystal, Nikia, (who died in 2004) and Brittany, and two grandsons, Levon and Buddie III. Emmons' wife Peggy often accompanied him to steel guitar shows and conventions, and helped Buddy meet fans and sell recordings and videos. She died on December 19, 2007. Emmons died of a heart attack in Nashville, Tennessee on July 21, 2015. ^ a b c Kingsbury, Paul; McCall, Michael; Rumble, John, eds. (2012). "The Entries, A-Z". The Encyclopedia of Country Music (2nd ed.). New York: Oxford University Press. Retrieved June 23, 2017. ^ a b "The Steel Guitar Hall Of Fame". Scottysmusic.com. Retrieved 2015-07-30. ^ a b "Concert and Conversation: The Big E: Salute to Buddy Emmons". countrymusichalloffame.org. Country Music Hall of Fame® and Museum. September 21, 2013. Retrieved June 23, 2017. ^ Hurt, Edd (July 30, 2015). 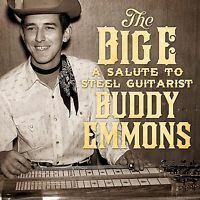 "Remembering Steel Guitar Innovator Buddy Emmons". Nashville Scene. SouthComm. ^ a b Morris, Edward (July 30, 2015). "Steel Guitarist and Inventor Buddy Emmons Dead at 78". cmt.com. Viacom. Retrieved June 23, 2017. ^ a b c d Liner notes to "Steel Guitar Jazz/Four Wheel Drive" (Steel Guitar Record Club #5), written by Tom Bradshaw and Melvin Gregory. ^ "LITTLE JIMMY DICKENS". Nashville, TN: Country Music Hall of Fame and Museum. Archived from the original on July 7, 2007. Retrieved August 2, 2008. ^ a b "Country Music Article 78". Buddyemmons.com. 1955-07-04. Retrieved 2015-07-30. ^ a b c "Ask Buddy!". Buddyemmons.com. Retrieved 2015-07-30. ^ Roland, Terry (July 30, 2015). "Buddy Emmons: An Appreciation". The Journal of Roots Music (nodepression.com). Freshgrass. Retrieved June 23, 2017. ^ a b "1965 CSR article". Buddyemmons.com. 1937-01-27. Retrieved 2015-07-30. ^ "What Other People Are Saying About Buddy". Buddyemmons.com. Retrieved 2015-07-30. ^ a b Liner notes to "Ray Price and The Cherokee Cowboys (Columbia BCD 15843 JK) written by Rich Kienzle. ^ a b c "Buddy Emmons Credits - ARTISTdirect Music". Artistdirect.com. Retrieved 2015-07-30. ^ All Music Guide to Country: The Definitive Guide to Country Music - Vladimir Bogdanov, Chris Woodstra, Stephen Thomas Erlewine. Books.google.com. Retrieved 2015-07-30. ^ "Buddyemmons.Com!". Buddyemmons.Com!. Retrieved 2015-07-30. ^ McArdle, Terence (August 3, 2015). "Buddy Emmons, innovator on pedal steel guitar, dies at 78". The Washington Post. Retrieved December 22, 2017. ^ McArdle, Terence; McArdle, Terence (3 August 2015). "Buddy Emmons, innovator on pedal steel guitar, dies at 78". Retrieved 26 January 2017 – via washingtonpost.com. ^ "Buddy Emmons, Steel Guitar Legend, Dies at 78". Billboard.com. 1937-01-27. Retrieved 2015-07-30. ^ "Buddy Emmons | Album Discography". AllMusic. Retrieved 29 May 2017.